interested me throughout my life. I am drawn to the ocean because it is unexplored and mysterious. There are endless possibilities of otherworldly creatures that could live down there and I try to imagine them in my art. Celeste Withiam was born in Trumansburg, New York in 1999. 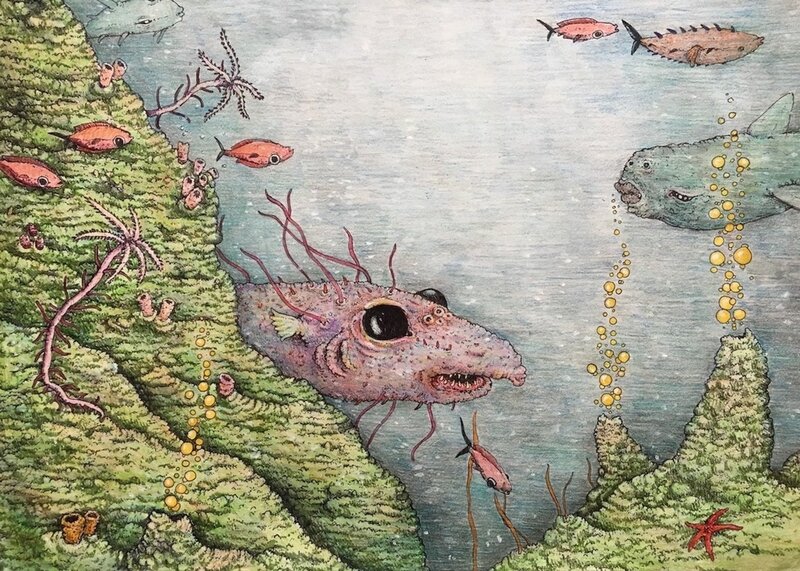 Growing up in the Finger Lakes region fostered a fascination with deep, mysterious water and the lives that could be led down there, leading her bit by bit to form a fantastic undersea world in her art. Her paintings often include imaginary sea creatures, deep sea vents and mythical sea-dwelling people interacting in playful vignettes. Celeste's training so far has included working with high school classes and local artists. She was awarded a Silver Key, two Gold Keys and a National Silver Medal from the Scholastics Arts Competition. She is studying at Pratt Institute in Brooklyn as a student of Fine Arts.